Apple might have nabbed a bunch of press with the announcement of their AirPods wireless earbuds, but – as with most of Apple's products – they weren't the first and nor will they be the best. 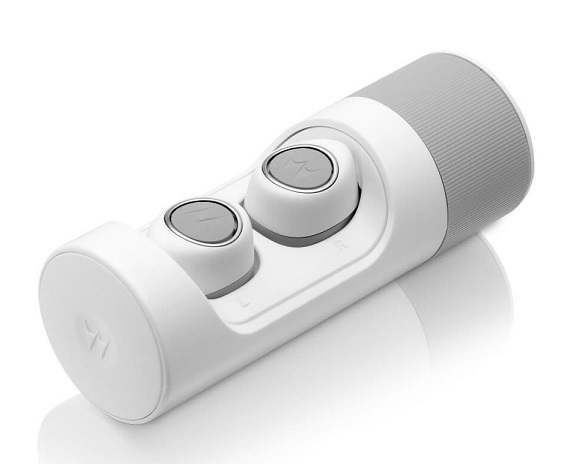 We've been testing that theory by playing with the Motorola VerveOnes Music Edition wireless Bluetooth earbuds. As with all Bluetooth headphones, these connect to your phone or media device wirelessly. However, both of the earbuds are completely wire-free also, meaning the entire package does not contain or use any wires at all. Except the charging cable, mind. 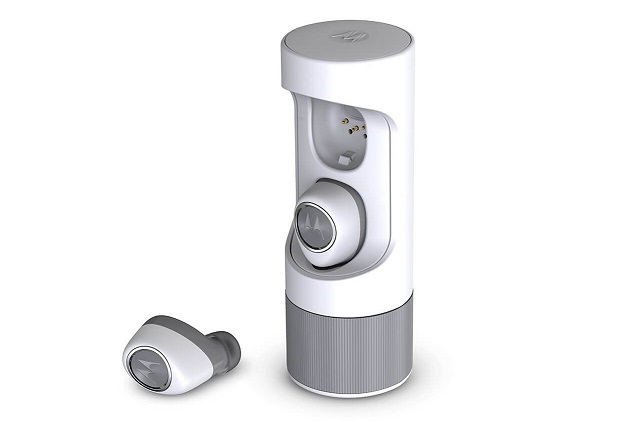 The small earbuds are designed to fit in each of your ears, pair with each other, then pair with your phone. No tangles and no dangles. The Motorola VerveOnes Music Edition comes with a twist-closing charge case, which not only charges the earbuds when plugged into a USB socket, but also holds a charge itself, allowing you to recharge on the go. The case is small, lets the earbuds fit very snugly and securely into it, and is no bigger than an asthma inhaler. Once charged, pop out the buds and stick 'em in your ears. They automatically detect when they're in and will link to each other, awaiting a connection to your phone or Bluetooth device. Obviously, this all worked very well, but you're probably wondering how well they stay in there, right? So did we, and after a week or so of use the results are positive... kinda. The Motorola VerveOnes Music Edition come with three different sizes of gels which will help to get a decent enough fit into your ear canal itself, but after that you're at the mercy of the shape of your ear. The main body of the buds aren't small, so we discovered that men (or people with typically larger ears) tend to be fine, while women (or, again, those with naturally smaller ears) had issues. You need them to be well in there and surrounded by your ear cartilage to guarantee a good seal, so bigger eared people won out. 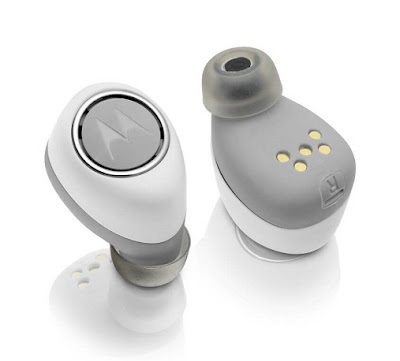 The Motorola VerveOnes Music Edition are waterproof and everything about their look and design would suggest they are great for fitness and exercise use. But almost every time we took them out for a run one of them popped out. Again, this will happen depending on your ear type and size, but as there is no wire 'safety net' linking it to the other, it'll fall to the ground. Fortunately all the times this happened the earbud wasn't damaged, and should you loose one of them completely you can use the Mototrola Hubble app to locate them. The app, which we've reviewed before on a couple of other products, keeps a track of the last location that your earbuds were connected to your phone, giving you a rough idea of where they should. And as they're white, finding them shouldn't be too much of a bother. And the actual sound? Well, okay we guess. The sound quality reminded us of Bluetooth headphones (the more traditional kind) of a few years ago, with a price range of £50-100. The Motorola VerveOnes Music Edition are brand new, and a lot more than that cost-wise, so it seems there are downsides to the portability and freedom they offer. For casual listening they were fine; times when you're not toverly bothered about the quality, and more interested in a bit of music to block out the world somewhat. Like when commuting to work. You're never going to lounge back at home to hear the intricate details of your favourite tracks on these, as they are more about rough and ready use. The batteries on the buds lasts about three hours between charges – which isn't great – but the case provided extra power to keep them going for around eight hours. Popping them into it to charge up till full doesn't take too long either, but you can't use them as you charge them, as you can with some other, more conventionally designed, Bluetooth headphones. All in all, the Motorola VerveOnes Music Edition come down to personal taste. If you want something that is definitely futuristic and innovative (at the expense of a few annoyances and lower quality of sound) go for it. If you're an audiophile who needs every thing to be perfect, steer clear.